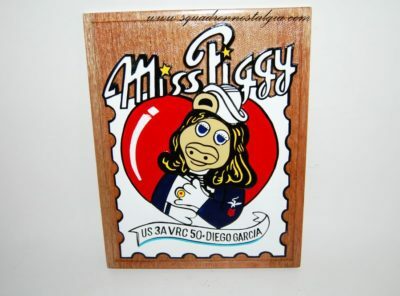 Coming soon…A 14 inch solid wood plaque that is carved and hand painted. The mission of VMGR-252 is to provide assault transport of personnel, equipment, and supplies, and to provide aerial refueling service to fixed and rotary wing aircraft. Specific tasks of the squadron are performed day and night in all weather conditions. The squadron strength varies, but it includes approximately 240 enlisted Marines, 50 Officers, and 12 aircraft. 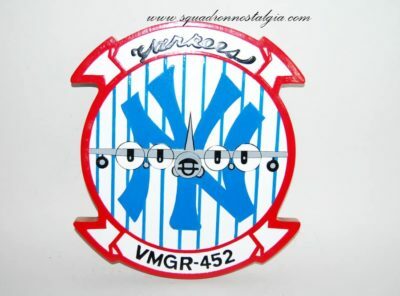 VMGR-252 is the oldest continually active squadron in the Marine Corps. It was formed 1 June 1928, and designated Headquarters Detachment 7M in San Diego, California. 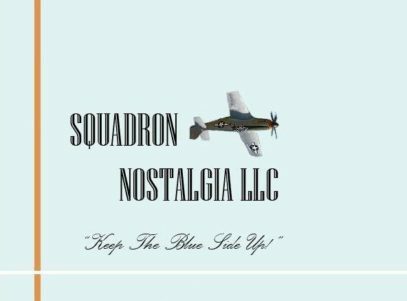 The Squadron was re-designated several times in the next decade. 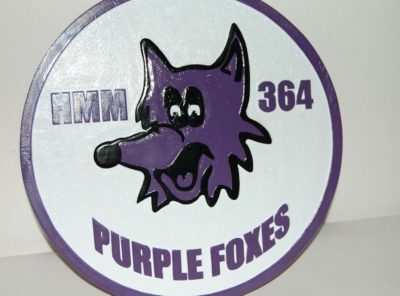 It received the designation Marine Utility Squadron 252 on 1 July 1941, and Marine Transport Squadron 252 on 1 April 1945. VMGR-252 was heavily involved during World War II and participated in the following campaigns: Pearl Harbor, Marianas, Iwo Jima, and Okinawa. 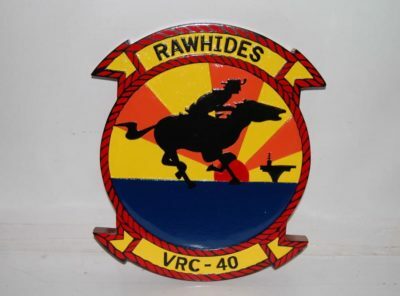 Following World War II, the Squadron relocated to Cherry Point, North Carolina and was reassigned to Marine Aircraft Group-21, 2nd Marine Aircraft Wing. 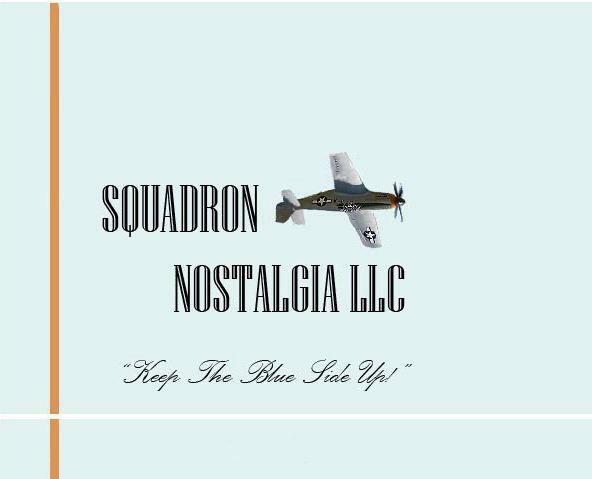 During June 1977 the Squadron was assigned to Marine Aircraft Group-14, where it is assigned today. During October of 1961, the KC-130F Hercules became VMGR-252’s squadron aircraft. 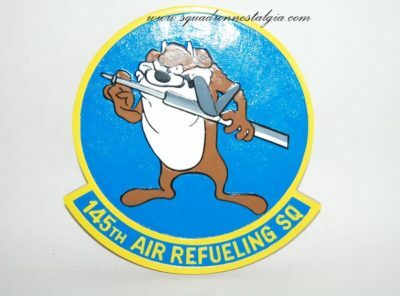 With the introduction of the KC-130F, the squadron’s primary mission was changed to aerial refueling. On 1 February 1962, the Squadron received its present designation as Marine Aerial Refueler Transport Squadron 252. In December 1965, the KC-130 was used to refuel the CH-3 helicopter. This was the first time that a tanker drogue system was used to refuel a helicopter. The late sixties and early seventies found VMGR-252 actively supporting American Forces in the Republic of Vietnam, transporting essential equipment, parts, and personnel. VMGR-252 also supported the introduction of the AV-8A Harrier. In August of 1973, VMGR-252 was involved in the development of safe and standardized aerial refueling procedures to be used with the Harrier. In July of 1981, 471 Marines from the Squadron were awarded the Humanitarian Service Medal for their efforts during May and June of 1980 assisting Cuban citizens who no longer wanted to live under the burden of Communism when Fidel Castro opened the gates to freedom for Cuban citizens. In December of 1988, VMGR-252 achieved another milestone in Marine Corps Aviation History when it surpassed 300,000 accident free flight hours and won the distinction of achieving the most accident-free flight hours of any squadron in the Marine Corps and Navy. The decade of the nineties started in earnest with VMGR-252 deploying aircraft to Freetown, Sierra Leone in support of 22nd MEU operations following civil unrest in nearby Liberia. In addition, the first night-vision-goggle landing in a Marine Corps KC-130 was accomplished in May of 1990. With little down time the Squadron found itself facing an even greater challenge with the mobilization of forces for OPERATION DESERT SHIELD. Six Squadron aircraft were deployed to form VMGR-252 Detachment Alpha. When OPERATION DESERT STORM commenced on 16 January 1991, the detachment transitioned to combat operations and provided over 10 million pounds of fuel to strike aircraft during the course of 937 combat sorties. During the remainder of the 1990’s, the Squadron continued to support East Coast MEU’s for operations in Kenya, Rwanda, Central Africa, Congo, Albania, Liberia, Sierra Leone, and Kosovo. Continued support for JCS taskings for Northern Watch, Southern Watch, and Keflavik Search and Rescue, were also provided. 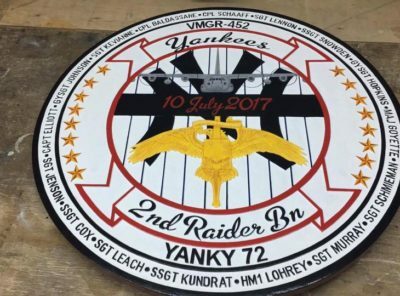 The 21st century began for VMGR-252 much as it began for the rest of the Marine Corps, with Squadron Marines and aircraft deploying in support of the Global War on Terrorism. After the attacks on September 11th, 2001 VMGR-252 formed the backbone of logistical and assault support operations during OPERATION ENDURING FREEDOM in Afghanistan and provided similar support for the 26th MEU in Iraq during OPERATION IRAQI FREEDOM in the spring of 2003. December of 2002 marked a milestone in the history of VMGR-252 with the acceptance of three KC-130 J-model aircraft. While most squadrons would stand down to transition to a new aircraft, VMGR-252 has added eight additional KC-130Js and transitioned the majority of the Squadron pilots and aircrew to this state-of-the-art aircraft while simultaneously supporting the 22nd, 24th, and 26th Marine Expeditionary Units with R-model aircraft in OPERATIONS ENDURING FREEDOM and IRAQI FREEDOM as well as contingency operations around the globe. Operational support of these efforts continued well into 2004, with the last deployment of VMGR-252 KC-130R “Legacy Aircraft” returning from supporting the 22nd Marine Expeditionary Unit in August of 2004. With the J model transition, the Squadron now prepares for the first operational deployments of the new KC-130J planned for the beginning of 2005. VMGR-252 has been in continuous service around the world for the past 76 years. The Squadron has flown over 30 different types of aircraft, and since the receipt of the first KC-130 the Squadron has continued to achieve many firsts in Marine Corps Aviation. Today, as always, VMGR-252 stands true to the hallmark of versatility for which it is known. Whether the mission is ground or aerial refueling, assault support, battlefield illumination, or aerial medevac, the aircraft and Marines of VMGR-252 stand ready to continue their fine history of supporting the global operation of the United States Marine Corps with success. 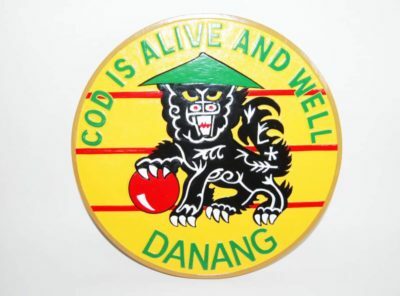 VRC-50 Da Nang “Cod is alive and well” Plaque A beautifully carved 14 inch solid wood plaque of the VRC-50 Da Nang patch. Collect all your squadrons with truly artistic craftsmanship of the Navy’s finest symbols. 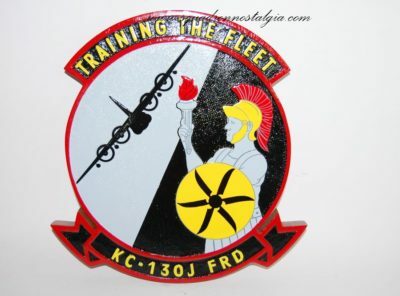 “Training the Fleet” KC-130J FRD Plaque A custom 14 inch wood plaque of the KC-130J FRD.